Let’s chat about the hidden promotional opportunities you and your business have as a result of your day to day interactions with clients and others. Many say that word of mouth is your best advertising. If so, perhaps the second best is being able to utilize existing relationships to cross-promote who you are, and what you do. Allow me to offer two examples using BizVid Communications, the production company which I co-own with partner and ten-time Emmy winner, Bill Gruber. First example. We have worked with the Small Business Administration in San Diego and Imperial Counties for a number of years. 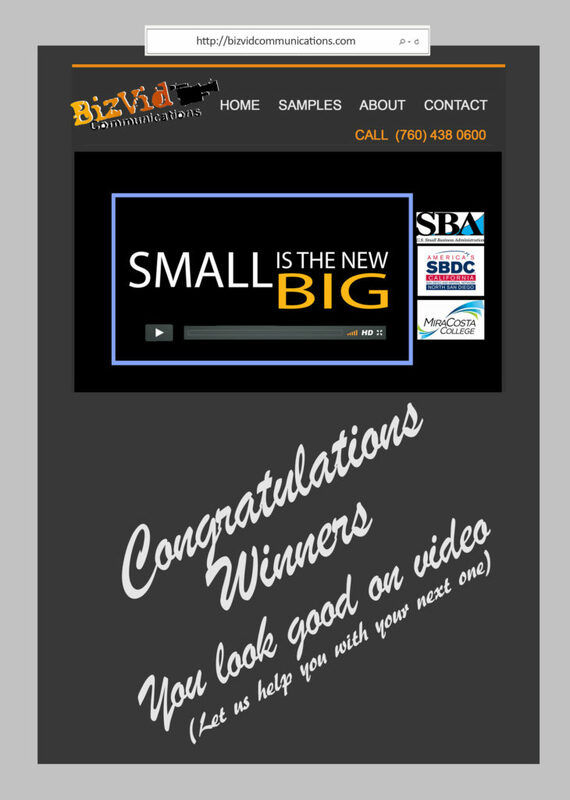 Our recurring video project for SBA is to interview the award-winners and record their insights as the selected winners of the SBA’s various awards (small business owner of the year, veteran-owned business of the year, minority business person of the year and so forth). We then play back those interviews on a giant screen during the annual awards banquet. Of course, we provide very reasonable pricing for our services for this prestigious client. In return for our “above and beyond the call of duty efforts” the SBA offered us a full page ad in their printed awards program as a “Gold Sponsor.” We accept that offer, of course. As a result, we receive free advertising about our services and benefits in a publication that is distributed to a banquet hall full of attendees comprising the leading businesses and executives throughout the small business community. Not bad for a free cross-promotion. This is the cross-promotional “Gold Sponsor” ad that the SBA gives us in appreciation for our video production efforts on behalf of their annual “Best of the Year” awards ceremony. Second example. Because of my interest in broadcasting and my love for Judeo-Christian topics, I volunteer to host a weekly radio show on a prominent Salem Media Group station, KPRZ Radio. The show is called Come Together San Diego. In exchange for my weekly volunteer efforts, the station gives my company and me free advertising time within the weekly broadcast. As the show’s popularity grows, so does our company’s exposure. Again, not bad for a free cross-promotion. Ask yourself, “what opportunities might there be, hiding just under the surface of your business and personal interactions, where your company can be presented and your success enhanced?” I know that you can come up with some. So, go for it and enjoy the additional business exposure!